The trail is breathtakingly beautiful. There are long stretches in the open and I get concerned about the heat. Of course there is a waterless stretch, longer than I would like it to be. Sometimes there are bushes and suddenly there is a big snake on the trail. However, I don’t know if it is still alive and I didn’t find a venomous snake now on wikipedia that looks like this. I just took a big step. At the first water source there is a young woman. A thru. She has a buzz-cut and big pack. She gets water as well. Later I catch her as she is going slow. She asks me, where I’m headed. I just say “south”. She sais just “nice”. Later I stop to eat something and she catches me. I don’t know exactly how to handle the situation as I am much faster than her. She asks me if I want to go before her. It was the last time I saw her. 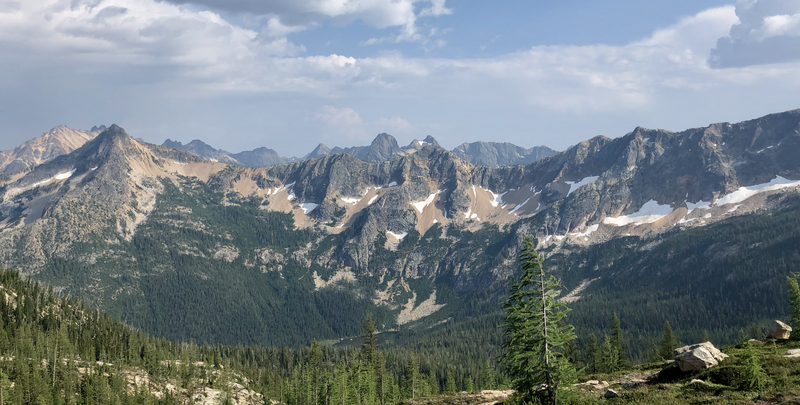 Many say the switchbacks up to Cutthroat pass (nice pictures there) and Methow pass were hard. I just notice the climb but I feel really well on top of both passes. After Methow comes Rainy pass. It’s just a road and as hiker you have to cross it. 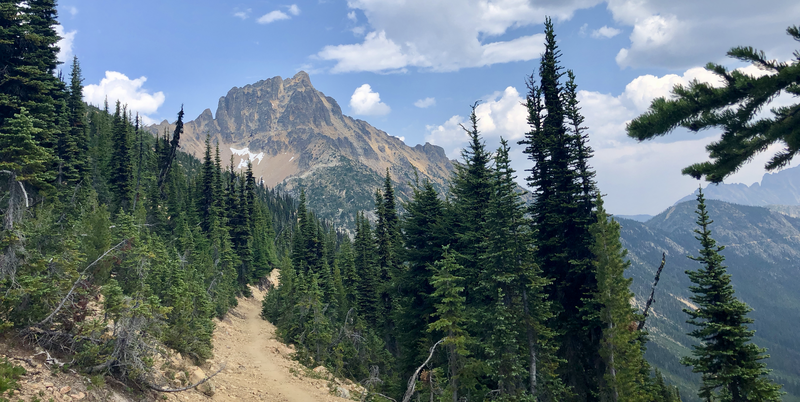 There are many day hikers in the descent to Rainy pass, most of them have already pitched their tents. I don’t fear the lightning directly, as I am not exposed but if there is a lightning strike, this forest has a huge problem. It is really dry here. It rains a little bit and it hales for approximately five minutes. And I have to break the rules for the first time. On the entrance of the Cascades national park, a sign informs me, that I need a special permit, on top of my PCTA long distance permit. It’s free, but you can only obtain it somewhere – and learn about LNT at the same time. It is late in the evening, I feel kind of done for the day, no way for me to go back to Rainy pass and hitch to where ever just to get such a permit. The park writes on the website, that you can call a number, if you are a thru. I am not a thru anyways. Even if I would do the entire trail. And they didn’t mention this possibility on their sign. It is impossible to know in advance. There are still people in the forest, also groups but no rangers who control me. The spot I use to sleep is an established camp site, I even pack some trash. It is not even however and I put up the tarp because I don’t know if there will be more rain during the night. As I later learned, the PCT was closed just days after I passed there. Fire.